As noted last week, December got an exceptionally warm start in the contiguous 48 states of the U.S., and that trend has continued even more strongly through the first third of the month. Except for 2 weeks in October, nationwide temperatures have been warmer than average every week in 2012 and for 50 of the last 52 weeks. For December 1-10, temperatures have averaged above normal everywhere from coast to coast. In the calender week ending December 8, of the 215 first-order National Weather Service (NWS) stations reported weekly by the Climate Prediction Center, 1 was missing (Glasgow, Montana), none were equal to or colder than average, only 1 was 1° above average (Key West, Florida), 2 were 2° above, and all the rest were at least 3° above. Over half of the reporting locations were 10° or more warmer than average, and 15 of them across 10 states (AL, AR, IA, IL, IN, KY, MO, MS, SD, TN) had departures of 15° or more for the week. Even in a year with very warm extremes in January, March, and July, this was some serious heat. For the country overall, the average for all 214 NWS stations was slightly over 10.0° above normal, and the National Climatic Data Center (NCDC) geographically adjusted average was 8.9° above average. Temperatures have not only been consistently warm over a wide area, but many individual locations have set records. For the first 10 days of December, new daily record high temperatures have outnumbered record lows by a ratio of 92 to 1. For the 48 contiguous states, the ratio was an incredible 132 to 1, since 3 out of the 10 low records were in Alaska and Hawaii. During the entire week of December 2-8, not a single low temperature record was tied or broken in any of the 50 states, according to NCDC reports. With 3 weeks remaining in the year, the cumulative ratio of heat records to cold records for 2012 has reached 6.0 to 1, more than double the ratio in 2011. 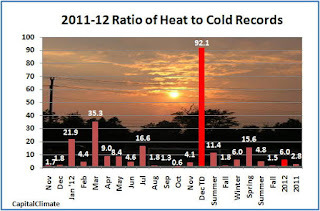 - Monthly ratio of daily high temperature to low temperature records set in the U.S. for November 2011 through December 2012 to date, seasonal ratios for summer 2011 through fall 2012, and annual ratios for 2012 and 2011. Counting Down to Washington's Record Warmest Year: "It Hasn't Warmed Since 2012!" 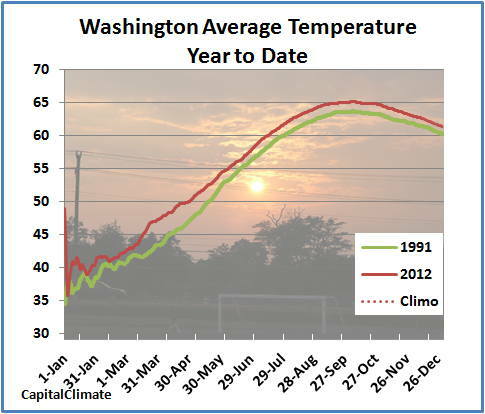 2012 WAS THE WARMEST YEAR ON RECORD FOR WASHINGTON DC WITH AN ANNUAL AVERAGE TEMPERATURE OF 61.5 DEGREES. 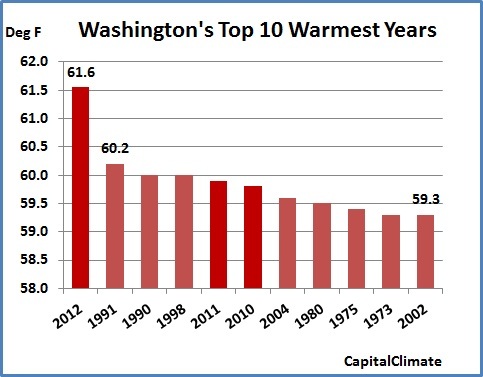 THE PREVIOUS WARMEST ANNUAL AVERAGE TEMPERATURE ON RECORD WAS 60.2 DEGREES IN 1991. THE AVERAGE TEMPERATURE FOR 2012 WAS 3.3 DEGREES ABOVE THE 1981-2010 NORMAL AND WOULD BE COMPARABLE TO THE NORMAL ANNUAL TEMPERATURE OF ATLANTA...OKLAHOMA CITY AND SAN JOSE...JUST TO NAME A FEW LOCATIONS. DULLES ALSO EXPERIENCED THEIR WARMEST YEAR ON RECORD WITH AN ANNUAL AVERAGE TEMPERATURE OF 57.9 DEGREES IN 2012. THE PREVIOUS WARMEST YEAR ON RECORD WAS 1998...WHEN THE ANNUAL AVERAGE TEMPERATURE WAS 57.1 DEGREES. 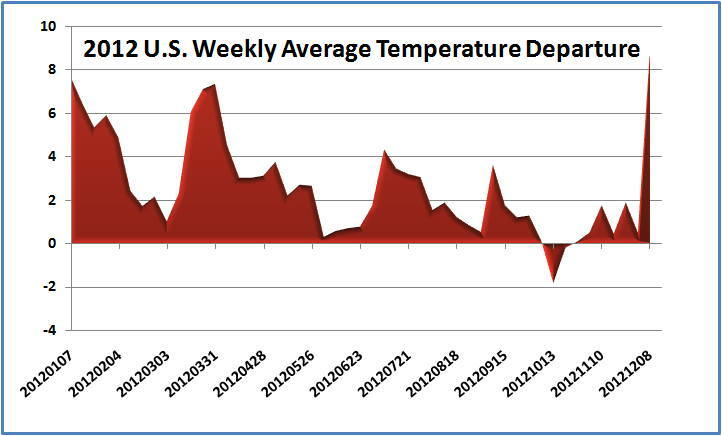 THE 2012 AVERAGE TEMPERATURE WAS 2.6 DEGREES ABOVE THE 1981-2010 NORMAL. 2012 WAS THE THIRD WARMEST YEAR ON RECORD FOR BALTIMORE WITH AN ANNUAL AVERAGE TEMPERATURE OF 58.6 DEGREES. ONLY 1931 AND 1949 WERE WARMER WHEN THE ANNUAL AVERAGE TEMPERATURES BOTH YEARS WERE 59.2 DEGREES. THE 2012 AVERAGE TEMPERATURE WAS 3.5 DEGREES ABOVE THE 1981-2010 NORMAL. December 29 Update: Today's high of 42° exceeded expectations by 4°, so the gap to a final yearly average of 61.6° has narrowed to less than 0.004°. A miss of Monday's forecast low of 26° could be the clincher. December 28 Update: Today's +4° temperature departure means the remaining 3 days need to average -0.5° or warmer to clinch a 1.4° excess over the old annual record. The forecast is for a deficit of 2.1°, however. December 27 Update: Thanks to continued above-average temperatures, a departure of just 1° in the next 4 days would be enough to raise the final yearly average to 1.4° above the old record. December 25 Update: Yesterday was just the second day this month with cooler than average temperatures (2° below). Today's high outpaced expectations, however, as so many recent days have done. The year-to-date average is outpacing the previous record by 1.3° at 61.9°. With less than a week now remaining, it is now highly likely that the final yearly average will break the record by that amount. The forecast temperatures for the next 6 days average exactly equal to normal, and the average would have to be at least 5° colder in order to avoid a final average 1.3° above the old record. On the other hand, a departure of just +1.2° for the final 6 days would raise the yearly average by another 0.1°. December 17 Update: Today's low of 48° through 5 pm is 2° above the normal high. At this point, even if temperatures set new record lows and record cold highs for every day in the next 2 weeks, it will still be a record warm year. December 13 Update: The temperature departure from normal required to avoid setting a new record is now over 22° for every day for the rest of the year. Since that is clearly not happening soon, we are verging on the realm of physical impossibility to avoid a record. The average of all record low temperatures for every day from the 14th through the 31st is -25.5° relative to normal. December 12 Update: Yesterday's high/low temperatures went virtually midnight to midnight; the final values of 62°/41° averaged out 11° above normal. Today was considerably colder, but the 47°/39° range was still 3° on the warm side. Using the forecast temperatures for the next 7 days and climatology for the remainder of the month yields a projected yearly average of 61.4°. It would have to average almost 21° below normal for the rest of the month in order to avoid breaking the previous record. With just 3 weeks remaining before New Year's Eve, it's becoming increasingly evident that the climate denialists will have to find a replacement for the tired old talking point, "It hasn't warmed since 1998." 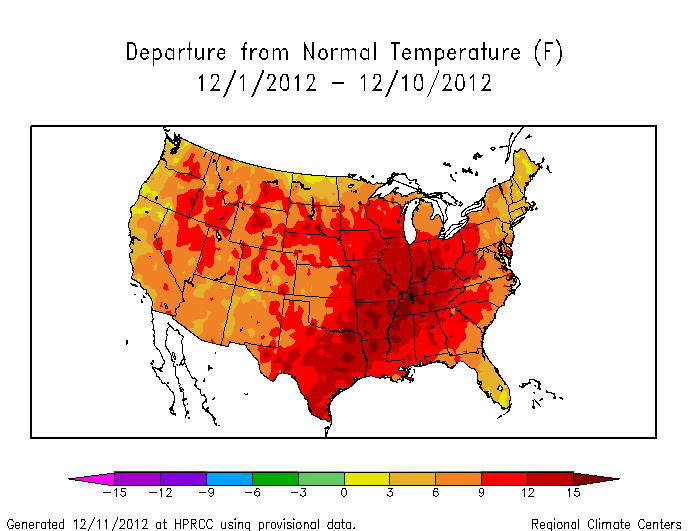 As the November climate summary showed, 2012 is well on its way to being the warmest on record in the U.S. contiguous 48 states. That will most likely be true in many individual locations as well, particularly in Washington DC. While well below the record for December 10, today's high of 63° was 15° above average, and the low so far of 49° is a degree above the normal high. This puts the average for the month over 50°, more than 7° above normal to date. If this were to continue through the end of the month (extremely unlikely), it would be the warmest December on record by over 4°. The year-to-date average temperature of 62.7° is 1.2° above the pace of the previous record warmest year of 1991. If the remaining 3 weeks average just normal (high/low range of 48/34 currently, declining to 44/29 by the 31st), the final 2012 average (marked "Climo" on the charts) will still be 1.1° above the old record. This is a huge amount for a yearly average, as indicated by the top-10 chart, which shows only a 0.9° difference between the current record and the 10th place year of 2002. It will certainly be colder between now and the end of the month, but how much colder would it have to be to avoid breaking the record? Assuming today's low remains unchanged through midnight, the remaining 21 days of December would have to average an eye-popping -18.1° relative to normal just to tie with 1991. That means an average high for 3 weeks below 30° and an average low below 16°. While such a frigid blast is not physically impossible, it would take an incredibly intense and fanatical belief in the Ice Age Fairy to think that it will happen. Stay tuned; we'll keep you posted as this historic event unfolds. Note: While not unexpected, these results were so extreme the the Climate Capitalist suspected that the data monkeys down at Momma Nature's Weather Grill had gotten into the eggnog a bit early. A cross-check of the daily year-to-date values with the monthly averages and a comparison of the projection with a hand calculator confirmed the data, however. December 14 Update: The average temperature at Minneapolis for the first 2 weeks of December is 7.2° warmer than normal. Only 2 days so far have been colder than average. See here for more on this developing Ice Age. The final total for Minneapolis was 10.5". A RECORD SNOWFALL OF 11 INCH(ES) WAS SET AT ST CLOUD MN YESTERDAY. THIS BREAKS THE OLD RECORD OF 5.1 SET IN 1961. 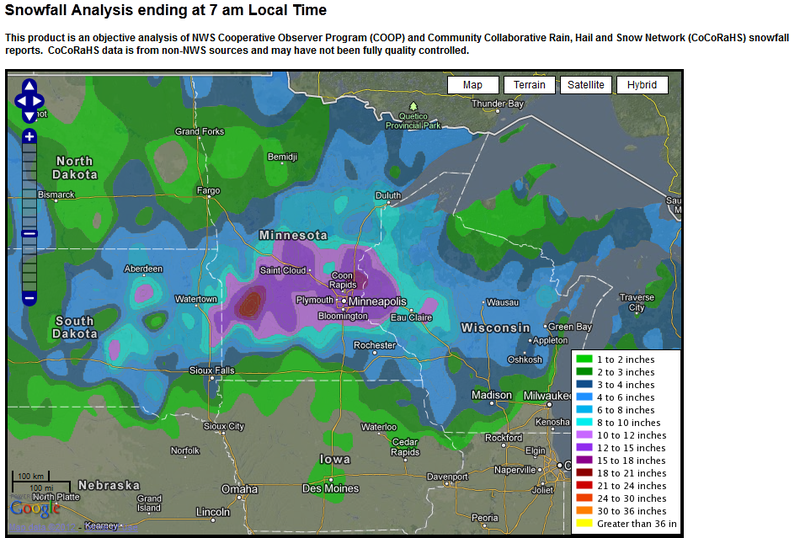 A RECORD RAINFALL OF 0.87 INCH(ES) WAS SET AT ST CLOUD MN YESTERDAY. THIS BREAKS THE OLD RECORD OF 0.36 SET IN 1899. WAS SET ON THIS DATE IN 2009. 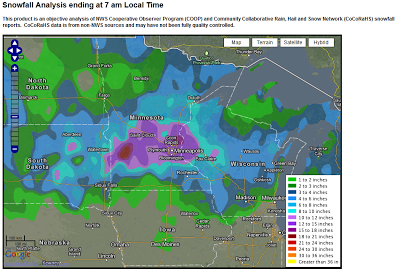 A RECORD SNOWFALL OF 10.2 INCH(ES) WAS SET AT TWIN CITIES MN TODAY. THIS BREAKS THE OLD RECORD OF 7.4 SET IN 1961. So far this month, the Minneapolis temperature has been 11.2° above average.